There’s something special about Finland that makes this usually cold, snow-covered country of the north the perfect destination for a summertime bike tour. With a population of just 5.5 million people (most of which are centered around the country’s capital city of Helsinki), Finland admittedly lacks the big cities and iconic monuments you find in so many other European countries. Instead, Finland offers something even better for those who want to experience the unending nature of the north. With more than 188,000 lakes, 179,000 islands, and forests covering 86% of the country’s land area, Finland is the largest forested space in all of Europe… and one of the few places in Europe where moose, brown bears, wolves, and wolverines run wild. If you’re tired of cycling in the city and you want to get out and explore a truly breathtaking never-ending wilderness, then a bike tour in Finland might just be the experience you’ve been looking for! I recently had the pleasure of participating in a short week-long bike tour across central Finland with a company called “Upitrek.” This self-guided bicycle tour begins in the city of Kajaani, Finland (population 35,000+) and ends in the tiny town of Lentira – just a short distance away from the Finland/Russia border. During the bike tour you will cycle past hundreds of kilometers of pine, spruce and birch trees. Dozens of lakes are spotted along the route, and the tour ends with a truly unique nature-viewing experience (which I will tell you about in just a moment). For more information on this self-guided bike tour in central Finland, be sure to visit the Upitrek website at www.upitrek.com. In addition to this bike tour, the company offers hiking, show-shoeing and cross-country skiing tours as well. Getting to Kajaani, Finland for the start of this week-long bike tour isn’t as difficult as it might sound. Most tour participants fly into Helsinki, Finland and then either fly to Kajaani (an 80-minute flight) or take a train to the city (a 6-hour ride). Once in Kajaani, you will be met at the airport by Urpo (the owner of the Upitrek tour company) or one of his employees, and you will be shuttled into Kajaani and put up at one of the city’s nice hotels. While in Kajaani, be sure to stroll the main street, which runs from the outdoor market on the corner of Kauppakatu and Lönnrotinkatu to Ämmäkoskenkatu and the intersection of the town Library and the Kajaani Castle ruins (which are situated on a small island in the middle of the Kajaani River). There are several good restaurants, cafes and bakeries scattered throughout the city, as well as plenty of good sporting good stores and shops. When the sun sets late at night (it doesn’t set until after 11 PM during the summer months) be sure to go and sit by the river and take in the colorful evening sky. What Kind Of Bicycles Will You Be Using? Most of the people who choose to participate in this particular bike tour will travel to Finland without a bicycle and will opt to have a bicycle given to them for use while on the tour. 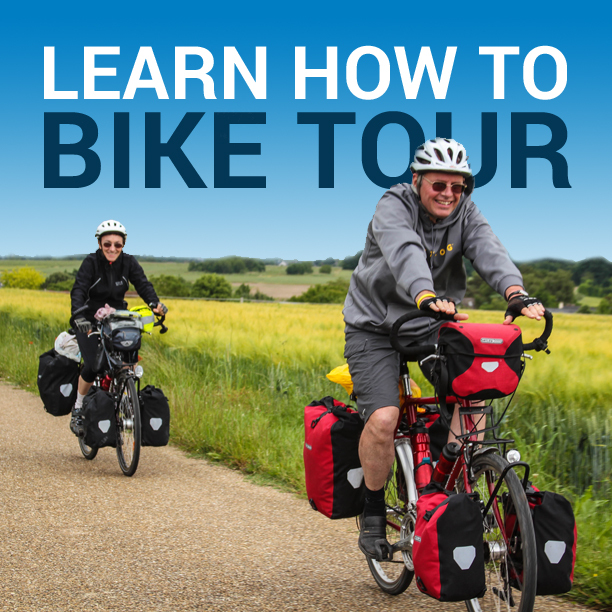 The bikes that are used on this tour are European hybrid bikes, which are best-suited for on-road riding, but can also handle a fair amount of dirt and gravel roads as well. You can opt to ride your own bicycle on the tour, if you so wish, but there is a certain level of ease that comes with not having to pack, prepare and haul your bicycle to Finland. Instead of going through the trouble of bringing your own bike, let Upitrek handle your bicycle for you. Just show up in Kajaani for the start of the tour and a bicycle will be waiting for you! I personally chose to use my own bicycle on the tour, not because I didn’t want to use the bicycles provided by the company, but because I combined this bike tour with a much longer self-supported bicycle tour I was conducting at the time (cycling from Poland to Finland and beyond). This is why, when you see the photos of me and my bicycle in this review, I am carrying so much gear on my bike. It’s not because you need this much gear to participate in this bike tour, but because I was carrying all this gear on my previous bicycle touring expedition. Most tour participants travel to Finland and have both the bicycle and a set of rear panniers provided for them by the Upitrek tour company. Although some tour participants may opt to bring their own panniers – which are usually filled with about one week’s worth of clothing, toiletry and personal items. You will need to carry your own clothing, food and gear with you on this bicycle tour… although there is an option to have your personal items transported for you from one hotel to the next (at an additional cost). Who Are The Tour Leaders? Even though you will be met by Urpo (the owner of Upitrek tours) or one of his employees at both the start and finish of your bike tour across central Finland, this is a self-guided bicycle tour, which means that for most of the tour you will be traveling on your own (without a guide) and will be responsible for navigating a pre-designed course and showing up at your prearranged accommodations on time. If you get lost, you will need to find your way. If your bicycle gets a flat tire, you will need to repair it. And while breakfasts are included on most (if not all) days of the tour, you will be responsible for making your own lunch each day and either preparing or finding your own dinner each evening. What Can You Expect To See & Do Along The Way? If you like cycling through the forest, then you will love this bike tour in central Finland. Starting from Kajaani, you will cycle east toward Russia for about 170+ kilometers, while passing through the small cities of Vuokatti, Sotkamo and Kuhmo along the way. Between these tiny towns there is a seemingly never-ending expanse of coniferous taiga forests and lowland marshes, with little arable land. The roads are mostly flat or rolling, although there are a couple short, steep climbs along the way. 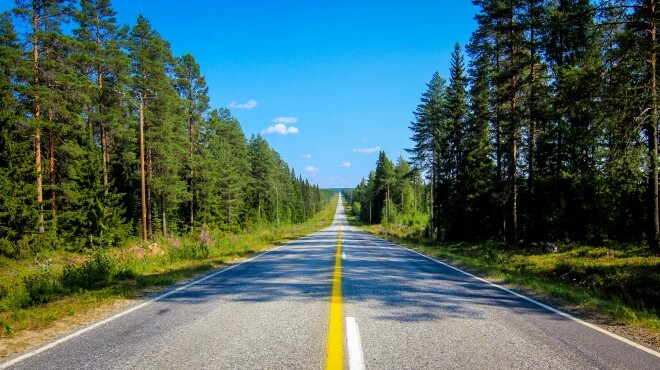 The route is paved the entire way and the roads are in excellent condition. While there are few dedicated bike paths along the route, the kilometers go by quickly and vehicle traffic is light. If the weather is warm, you will need to carry plenty of water on your bicycle as you ride each day, as there are few places to stop along the way and fill up. Restroom stops are also extremely rare, so be sure to take care of business before you leave your accommodations in the morning, and take advantage of any available toilets you may find along your route. In the resort town of Vuokatti it is recommended that you take the time to climb up the short, but steep road that takes you to the top of the local ski resort. From the top of the hill/mountain, impressive views of the local area can be taken in. Dozens of lakes can be seen from the summit, and the area is frequently in use as a mountain biking mecca, as well as a summertime training area for winter athletes (such as ski jumpers and cross-country skiers). While there may be thousands of lakes in Finland, very few of them can be accessed (or even be seen) from the road. So when you find yourself cycling along the edge of a lake in Finland (like you see me doing in the photo below), be sure to stop and enjoy the experience. Maybe even get off your bike and sit for a while, take in the scenery and appreciate where you are. Finland has some truly magnificent lakes and rivers, but to experience them fully, you need take the time to thoroughly take them in. Many of the people who come to Finland (both in the winter and the summer) come to the country to see and experience a wilderness unlike any found in mainland Europe… and I can see why! The forests in Finland are vast, inviting and (on occasion) quite spectacular. If the thought of cycling down the road in the photo below excites you, then I think you’ll enjoy this bike tour across central Finland. The accommodations on this bike tour vary from location to location. In Kajaani you will be put up at one of the city’s few hotels. In Vuokatti, you will stay in a large cabin-like duplex community along the edge of Lake Särkinen. In Kuhmo you will stay a large, modern hotel overlooking Lake Lammasjärvi. And, if you choose to participate in the optional nature-viewing experience on the last day of the bike tour, you will be put up in a small B&B in the tiny town of Lentira. My favorite accommodation on this bike tour was at the cabin-like duplex community in the resort town of Vuokatti. This large, modern cabin featured a full kitchen (with a range, microwave, coffee-maker and oven), living room, bedroom (with 2 beds), bathroom, an in-room sauna, and a private patio with views of the nearby lake and forest. The hotel in Kuhmo, Finland was another lovely lodging place on this bike tour. While the building looks a bit dark and Gothic when first approached from the front of the building, the hotel has a warm and inviting dining room situated on the edge of Lake Lammasjärvi, with forest and water views in almost every direction. If you have the time, be sure to take a long walk around the hotel in Kuhmo. There is a skinny strip of land that stretches from the shore near the hotel entrance and extends into the center of the lake – an excellent place for an evening walk or even a short swim! What Is The Food Like On This Bike Tour? During the course of the Upitrek bike tour, you will be fed a buffet-style breakfast at each of your accommodations along the way. However, you will be on your own each day for both lunch and dinner. But don’t worry, finding food on route is easy. Each of the cities you’ll be visiting on the bike tour has one or more supermarkets where food can be purchased. Plus, both the hotels in Vuokatti and Kuhmo having restaurants attached where dinner can be ordered. My favorite meal was at the hotel in Kuhmo, Finland, where I ordered a delicious dinner salad, an entree consisting of cooked veggies and tofu (this was the vegetarian option), and ice cream for dessert. When the bike tour comes to an end, you have the choice of participating in a unique and memorable nature-viewing experience. If you choose to participate in this part of the tour, you will be driven out into a remote forest just a few kilometers from the Finland/Russia border and placed inside a large wooden bear hide. This is a small, cozy building designed specifically for nature-viewing. Once inside this wooden hide, you will need to remain extremely quiet for several hours on end. Meat of various sorts will be placed outside the hide and then you’ll need to sit and wait for nature to run its course. If you’re lucky, you will get to see one or more of Finland’s largest carnivores – bear, lynx, wolves or wolverines. During my time in the hide, I didn’t see any bears or wolves, but I did see a wolverine, which you can see by watching the short video below. Experts believe there to be only 150 – 200 wolverines in all of Finland, so seeing such an animal in the wild is a truly memorable experience. Even though I didn’t see a bear during my time in Finland, the people that run the nature-viewing hide told me that bear sightings are extremely common… and are a real treat for anyone visiting Finland for the first time. Would I Recommend The Upitrek Central Finland Bike Tour? While Finland doesn’t have the big, historic cities or the iconic statues and monuments that are so famous in much of western Europe, it does have something unique to much of Europe and even the world – a large, beautiful, and truly wild forested area where trees, lakes and animals can be seen in great plenty. The beauty of Finland is truly in its details! Overall, the self-guided bike tour that Upitrek has put together is a good one. If getting into nature is your goal, and slowing down your lifestyle for a week or more sounds ideal, then I think you will truly enjoy this bicycle tour across central Finland. This entry was posted in Bicycle Touring Pro Articles, Europe, Featured Articles, Finland, Locations, Main Articles, Product & Service Reviews, Videos and tagged bear viewing, bike tour review, europe, finland, finland bike tours, forests, nature viewing, self guided bike tours, self-guided, upitrek, upitrek bike tours, urpo, what is a self-guided bike tour, wolverine. Accompany their cycling world, concert, cool, I want to learn from their experiences. I see your bike is a Thorn brand, correct? disassembles the frame, getting smaller the volume to travel by plane or bus, is it? We like to ride in germany, maybe one day do to Finland. One day come to Brazil. Porfirio Negreiros – Mossoro, RN – Brazil. Actually, my bicycle is not a Thorn. It is a Co-Motion Pangea!